One of the popular exercises on the course was threading your way through a set of cones. This is a good exercise taught the world over, as it requires good balance, posture and proper operation of the controls. Consequently it is also the area where new riders struggle the most – as the bike is more unstable and difficult to handle at low speeds and they are still learning coordinating all the controls. I learned from my UK CBT days that your best friend in low speed maneuvers is the rear brake. This stabilizes the bike by slightly lengthening the wheelbase which helps to keep the bike upright in low speed turns. Combine this with feathering the throttle and you’ll find a bit of rear trail-braking will have you executing perfectly controlled, low speed turns in no time. The MTC course barely mentioned this however, preferring instead to teach low speed maneuvers with a combination of feathering the clutch and front brake… Why is this a problem? Applying the front brake in a low speed turn with the handlebars turned even slightly will pull you to the ground like a magnet. 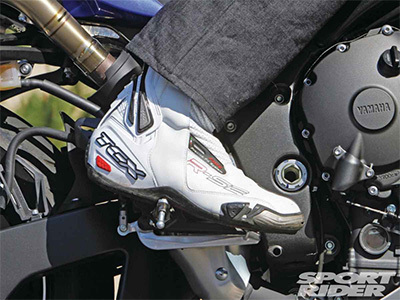 The front brake should be avoided at all costs when executing low speed maneuvers – not taught as a professional technique to a steady stream of new riders! It was no surprise to see student after student really struggle with low speed maneuvers on the course as they attempted to use a combination of front brake and throttle / clutch control. Several students – despite many attempts – were unable to weave their bike through the cones successfully and gave up in the end. It’s all very well weaving through cones on a private course – but out on public roads, mastering low speed handling of a machine that can often weigh upwards of 500lbs is critical to rider safety and survival. Teaching students from the very outset poor techniques that make low speed control so much harder is a really big fail of the MTC course. I have two other major gripes with the course. The first is every single minute of practical, on-bike training is conducted on a private, closed course. There is absolutely no formal training or instruction on public roads at all. In fact, you can go through the entire M1 licensing process without ever turning a wheel on a public road… The MTC course would be far more beneficial to all the riders that pass through it by taking students out on public roads, where they can acclimatize to public road-riding under the watchful eye of an experienced instructor. This brings me to my final issue, and I thought I’d end on the biggest one… This may very well be something specific to the course instructors on the day rather than a failing with the MTC course itself – but either way it’s still unforgivable. On my course, there were a couple of students who spent the entire course struggling. And I mean really struggling. They were just all-at-sea on a motorcycle. It didn’t matter what the task was, they just couldn’t grasp the basics of control or balance and spent the entire two days having an awful time tying themselves into all sorts of knots. We got to the skills evaluation at the end of the two days where you are graded on a series of practical riding tests and the first test up was our old friend – weaving through a set of cones. You failed this test if you missed or touched a cone, put your foot down or dropped the bike. Most got through successfully, but the two “strugglers” had a predictably awful time. One, a girl in her mid-twenties, was unable to complete the cones test despite being given three attempts to do so. The instructors gave up and moved the class onto the next exercise. As the skills evaluation progressed on, the two “strugglers” either visibly failed each test, or performed them to a standard so far short of what was requested I couldn’t see how they could be given anything other than the lowest marks. At the end of the skills evaluation, we were each called forward to receive our evaluation, scores and course completion certificate. This certificate waives the DMV riding test so fast-tracks you straight to your M1 license. My jaw hit the floor when the two strugglers walked away with their certificates, having been told they had passed the course?! I really couldn’t believe this… Surely MTC instructors have a responsibility to their students (and their students lives!) to not pass anyone on a basic training course that is really struggling to master the basics of motorcycle riding and control? The strugglers on my course were not only a danger to themselves, but rode at such a poor level they would have been a danger to other road users as well. How is this not putting lives at risk? Do MCT instructors not have a duty to step in here? How about doing the responsible thing and not handing over a course completion certificate to a struggling rider and suggest instead that they come back for more training to get their skills up to some sort of decent, acceptable level? Most MCT schools boast of a 100% pass rate in their advertising, but this is flat out irresponsible. Over the course of these couple of blog posts, I’ve highlighted many basic areas where the MTC course comes up well short for it’s customers. These are NOT advanced techniques being called out here. 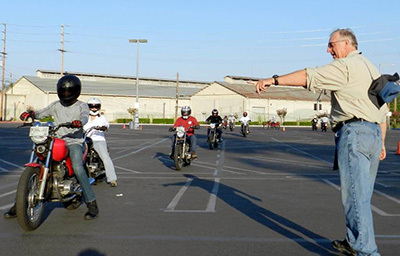 Things like head-checks, cornering, basic operation of the motorcycle (turning on/off, rear trail braking) etc are the fundamental basics of riding and control at entry level for any new rider, but if my experience at MRE Corp Simi Valley is anything to go by, these fundamental basics are either taught plain wrong, or worse, simply omitted from the MTC course. The overall problem with the program is it pitches being formal, official and CHP-sanctioned to new riders that don’t know any better, so they accept the training on this course as gospel. The sad truth is, by passing on bad habits and techniques to thousands of riders each year, and handing over course completion certificates to students that are in desperate need of more training simply translates into shocking riding out on real roads and eye-watering accident and mortality rates. I second Mark’s comments on the engine cut-off switch (kill switch-please!) Never use terms like that in a publicly presented course. That’s not the term manufacturers use in their manuals and I just looked through five old manuals from Brit, German and Japaneses bikes and none of them state the switch is exclusively for emergencies, rather that in an emergency, you shut the engine off as a primary need. I have 13 years of teaching and maintenance on our program’s motorcycles and the only switches that were replaced were due to crash damage. Your criticisms are better presented to the sponsor of the class directly so they may address your concerns rather than mere comments colored by your own biases. I hope the instructors are not recommending front brake usage in slow turns-that is very poor instruction and should be stopped immediately. Not going to argue the toss here but using the kill switch on the MTC was odd to me (and at odds with the training I’d received in the UK and my motorcycle owners manual). As a motorcycle instructor of over 25 years, I must say some of the experiences written about above are not necessarily true. So, to start with the writer did some math to decide how many times an engine cut off switch is used and how they would get worn out if he used it every time. Well, let me use my math to help understand how wrong his thoughts are. Let’s see, I have taught well over say, 10,000 students. Each of these students have turned their motorcycles off during an MTC using the engine cutoff switch at least say 20 times each class since there are 20 exercises. So, 20 times per student times 10,000 I come up with 200,000 times. Again over the past 25 years I have owned several training sites in California and I do the maintenance on these bikes. I have only ever changed the engine cut off switch on maybe half a dozen machines. Most of those due to a student dropping the motorcycle and breaking off the switch itself. Now, there are many other things to discuss about this artical but the hill I am going to die on is the information about the skills test. 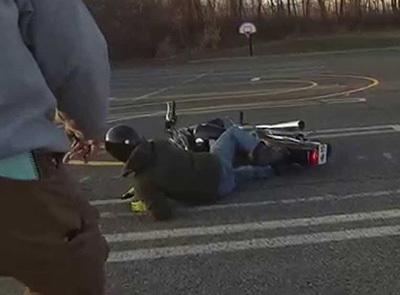 First of all, the only way a student fails is if they score above 20 or drop the motorcycle during an evaluation. So, hitting or skipping some cones during the weave isn’t an automatic failure. I would suggest the individual listen to the instructions before publishing their own opinion about the eval. Anyway, a student can get max points of 10 per evaluation. So, if my math is correct, that means by the approved evaluation by the CHP, that a student can totally blow two of the five evaluations and theoretically pass. There is one eval that has an exception and that is the 5th or braking evaluation. 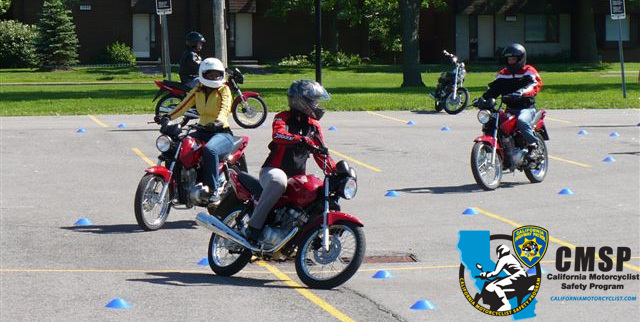 The evaluation is designed not to test a student how perfect they are at low speed maneuvers but more So about how a new student can control the motorcycle overall, safely. There are no quotas of how many people to get thru the class a month. The skills evaluation is black and white. Did they put a foot down or skip a cone? If yes they receive this many points. It is not a subjective evaluation and it is not the place for the MTC instructor to have an opinion. That way it is fair to anybody taking the course. I will say that when it comes to the individual debrief that every student receives after the course and when/if they get a graduation certificate they are encouraged to get more education. Those who were weak in certain areas are told about those weaknesses and encouraged to get more practice in a controlled environment before they get out on the road. Also, most sites in California offer a course for a student to return, for a smaller fee than the MTC, and ride more and get more practice. Anyway, I could go on for hours about what the author of this article experienced and what isn’t necessarily true or more of an opinion than fact. The MTC is a proven program and yes, it has some flaws but it is by far better than the parking lot training a rider might get at a dealer or from a friend when buying a motorcycle that does over 150 mph. Thanks for the comments Mark. My point about the engine kill switch is that most operating manuals I have ever read explicitly state this is an emergency switch only, and as such should *not* be used to ordinarily turn the motorcycle on and off. I would rather folks heed the advice of the company that designed and built their motorcycle than an alternative from an MSP course handbook… To your pass rate point – the school I attended seemed far more focused on a 100% pass rate than keeping folks off motorcycles who had no business riding one. The MSP completion certificate fast-tracks riders straight to an unrestricted M1 endorsement so with that in mind – I’d like to see MSP instructors taking a bit more responsibility to not hand out completion certificates to folks who really shouldn’t have one, and focus more on returning for more training. I accept the school I attended may be in the minority here, but I really have a problem with a blanket 100% pass rate being applied to riders who spend the entire day dropping their bikes and/or struggling to move off in 1st gear. From talking to my own students, I am not the only person who has seen people on their MSP struggle hugely throughout the course, and still walk off with a completion certificate at the end of it.